Rebel Pirate Diaper Cake is made of 75-80 Pampers Swaddlers diapers size 1 (8-14 lbs); Three flannel receiving blankets 100% Cotton; Four Pirate Squirters Bath Toys by Alex toys (two pirates, one shark, one cannon, one mesh bag for easy storage); one soft blanket with "Rebel"; one pirate bath toy; One sweater with pirate ship by Gymboree; one pirate rubber duck; two MAM pacifiers with pirate theme; one JOHNSON'S Baby Powder Pure Cornstarch with Aloe Vera & Vitamin E (Gently absorbs excess wetness to keep skin dry and soft) 1 1/2 oz; one JOHNSON'S Baby Shampoo (This mild, tearless formula baby shampoo is as gentle to the eyes as pure water) 1.5 fl oz; one JOHNSON'S HEAD-TO-TOE Baby Wash (Bathe your baby in pure gentleness) 1 fl oz; one DESITIN Creamy (A creamy formula with Aloe & Vitamin E to prevent and treat diaper rash) 1/8 oz; one JOHNSON'S Baby Lotion (With that unmistakable baby fresh scent) 1 fl oz. 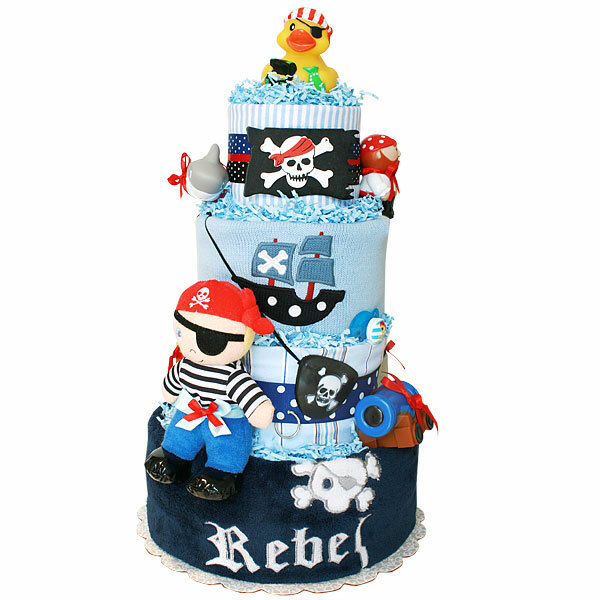 Black, red and blue ribbons and bows, blue crinkle paper, wooden embellishments with pirate theme. This cake sits on a 12" corrugated cake board and 20" high. Comes wrapped in cellophane with coordinating ribbons and bows. All our diaper cakes made of highest quality ingredients with greatest care and love. Everything included is ready to use and easy to disassemble.